What is it? How does it work? What does it feel like? Acupuncture involves placing very thin, flexible needles at specific points along the channels that cover your whole body. These points are chosen in a number of ways. Sometimes the acupuncturist will place points in or near the area causing pain, or along channels that relate to the area of pain. Some points are chosen because they are sensitive to pressure. Other points may be used because they have been shown over time to address specific problems - we call these empirical points. It's not uncommon to use leg points to treat a shoulder problem, or foot points to treat anxiety. An acupuncturist will spend time deciding which points are most appropriate for you, based on your chief complaint and associated symptoms. Your body is covered with a web of channels (also called meridians). Acupuncture points are located along these channels. Acupuncturists can use the channels to access other parts of the body as well; that's why you can use points on your hand to treat a headache, or a point on the back of the knee to treat low back pain. 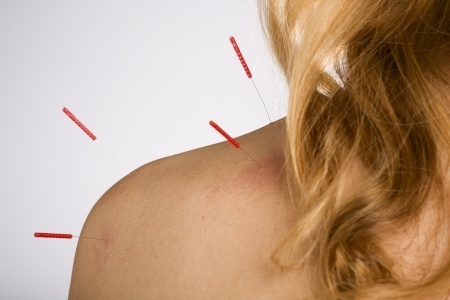 One of the most frequent questions people ask is "How does acupuncture actually work? How do those tiny needles make me feel better?" One way to understand this is to consider that in a healthy system, things are always moving. In a stream, water flows constantly, or else the water becomes stagnant and dries up. The same is true in your body - if qi (which is like energy) and blood fail to circulate for any reason, you end up with stagnation and reduced flow, and this causes disease and pain. Just as an unmoving stream is an unhealthy system, your body needs constant movement for optimal functioning. Acupuncturists try to restore movement and circulation to your body; this is one of the ways we help you feel better. Placing needles in points along the channels is one way of directing energy and blood to areas that are lacking. There may also be situations where your body has excesses or deficiencies of the "vital substances" (this refers to qi, blood, yin, and yang), and acupuncture can help correct this imbalance as well. You may experience these imbalances in a number of ways, such as feeling too hot or too cold, feeling either sluggish or jittery, experiencing pain that is dull or sharp, or seeing a decline in certain bodily functions as you get older. Acupuncture can help your body get all of these substances back into balance so you feel well again. Sometimes you will feel a sensation at the acupuncture point when the needle goes in. This sensation varies from point to point, and from person to person. Some points may cause a warm, full feeling where the needle is inserted. Others may feel sharp for a second, followed by a brief itchy feeling. Certain points cause a shooting sensation down your leg or arm; this feeling is usually strong (but not painful) and very brief. All of these feelings are normal and suggest that the acupuncturist has accessed the qi and blood at the point and that changes are already being made. It's okay to feel sensations at some points, some of the time, but not every point at every session. Your body is a little different each time you come in, and the way the points feel reflects that. The acupuncture needles in this picture have red handles. The stainless steel (silver-colored) part is so thin, it's hard to see in this picture. Jessica only uses single-use, disposable needles in her practice. These needles are very thin - usually 32-34 gauge, which is significantly smaller than the needles used by doctors for injections or blood draws. They are also much thinner than standard earring posts. Acupuncture needles are solid ("filiform"), meaning they are not hollow tubes. They are finely polished, flexible, thin pieces of stainless steel. Acupuncture needles come in a variety of lengths, and the acupuncturist chooses a needle based on the area to be treated. Ear points requite the use of very short needles, while points in the glut and thigh muscles may benefit from the use of longer needles. In Chinese medicine theory, we often talk about the Five Elements, and Yin and Yang. These elements are Wood, Fire, Earth, Metal, and Water, and each of these elements corresponds to different organs, and to different aspects of bodily functioning, health, and even personality. Ideally, the Five Elements are in balance with each other, and you feel healthy. If any of the Five Elements get out of balance, there may be illness. During your initial visit with Jessica, you will be asked questions that help her understand which elements are weaker or stronger, and how this is manifesting in your particular body. This helps Jessica formulate a treatment plan. This image shows the relationship between Wood, Fire, Earth, Metal, and Water. They are tightly bound, and exist in a specific relationship to one another. If these elements get out of balance, this may manifest as disease. Another way of assessing wellness and disease is to look at the balance of yin and yang in your body. Yin and yang can be thought of as the basis of everything your body does, or as the driving force behind all body functions. The tai ji symbol is familiar to many of us as a symbol of balance. This concept applies to the world around us; for example, the idea of yin encompasses such ideas as dark, quiet, low / grounded, and night. Yang includes concepts like bright, loud, high / heavenly, and day. In Chinese medicine and health assessment, we can use yin and yang to help us understand health conditions of excess, heat, and the exterior of the body (all yang signs) and deficiency, cold, and the interior of the body (all yin signs). Patients may present in a way that clearly shows yang excess, yin deficiency, or some combination of imbalances. Acupuncture can help bring yin and yang into balance, which helps you feel well. The tai ji symbol is a graphic representation of the relationship and connection between yin and yang.